Eliminating dead, diseased or damaged trees is a necessary component of maintaining your garden and ensuring it stays safe and beautiful. Additionally, your tree might become filled with dead branches and leaves that will hinder any further growth. Long and heavy branches often mess with telephone wires or threaten your home’s structures. 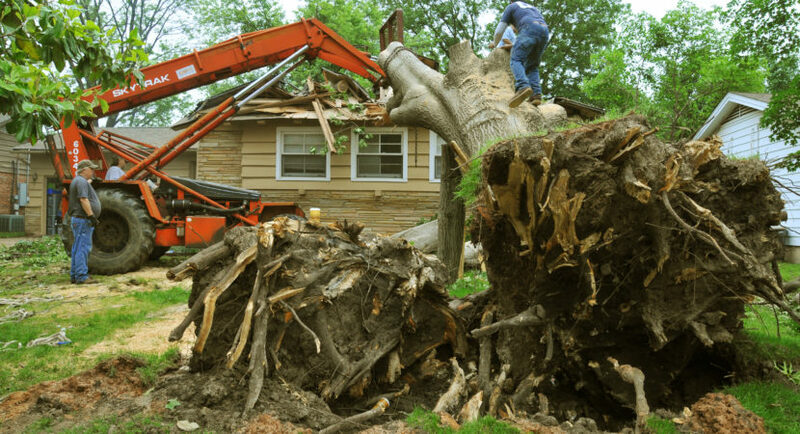 For these reasons, your home should certainly consider using a crane service for tree removal. So, how exactly do crane-assisted tree removals operate? Typically, telescoping boom cranes are used for tree removal. These cranes are utilized due to the fact that they are highly mobile and stable. Additionally, their lifting booms are able to telescope out to great lengths and tilt at a wide range of angles — both factors which make them perfect for tree removal. Prior to the cranes beginning their work, the tree and the ground will be thoroughly assessed to calculate how much resistance the tree will give to the crane. This analysis will include evaluating the root structure of the largest trees, as well as reviewing the condition of the soil the trees are growing in. This is vital because soils baked hard by droughts and dry weather, or soils rich in heavy and tenacious clays, can potentially mean that tree removal will be more challenging. At this point, professional crane operators will understand how much lifting force will be needed to remove any trees. Next, the tree in question will be hooked to the crane boom using a conventional logger’s sling. This sling is generally made from chains or wire loops and is sold by crane retailers who can advise you on the appropriate sling for your project. With the sling in place, the crane can then wrench the tree out of the ground vertically. This process may demand support from small diggers and excavators — especially if it is an ancient or large tree. Finally, the professionals will use a crane to swiftly and safely eliminate any dead, broken or otherwise hazardous branches. Additionally, a tree arborist can offer expert tree trimming and tree pruning services that will ensure your tree looks as attractive and healthy as possible. For many homeowners, it can be challenging to discern when a tree needs to be removed, as they may not be aware of the warning signs to watch out for. For this reason, it is always beneficial to speak with a professional tree removal company before deciding on a plan of action. Ordinarily, trees must be removed due to property or infrastructure damage, disease, or because they pose a potential threat to the home or grounds in the future. However, you should allow the experts to make the final decision when contemplating tree removal on your property. The professionals will be able to recognize any need you have, while also following all guidelines laid out by the state or city to ensure you abide by the necessary laws. What are the benefits of using a professional crane service for tree removal? 1. It is the safest option. One of the most significant reasons for choosing a crane service to remove trees from your property is with regards to safety. If you opt to remove a tree from your land with a crane, then you can be assured that any and all of the debris will be delicately lowered down to the ground. On the other hand, traditional ways of tree removal are more dangerous, as they let the branches and debris from the tree fall from the tree and end up all over the place. These traditional methods for extracting trees have a higher risk of damaging your home and the homes of your neighbors. For this reason, using a crane removal service is the safest course to take, particularly if you have large and stubborn trees. 2. It comes with skilled operators. When you opt to use a crane service for removing trees from your property, you are also choosing to have a skilled operator carry out the procedure. When you rent a crane, you are also renting an operator. This is incredibly beneficial as the operator will be proficient in tree removal and will already know how to work the crane you have rented. 3. It makes it easy to access a specialized crane. As cranes are helpful for a variety of different projects, there are many different types of cranes on the market. For example, the kind you would want to use for construction purposes will not be the same as the type you wish to utilize for a tree removal project. As the type of crane you need to remove trees is so specialized, you probably want to consider hiring one. 4. It is the cost-effective option. If you are looking to remove a couple of trees on your property, there is no reason to buy a crane. They aren’t cheap pieces of equipment, and if you aren’t going to use it regularly, what is the point of owning it? Unless you are going to use it incredibly frequently, renting a crane is undoubtedly the most cost-effective option. 5. It is a highly efficient choice. In addition to being the safest option and the most cost-effective, renting a crane is also the quickest, most efficient way to go. If you opt for a more traditional method of removing a tree, then you are most likely going to have to rig parts of the branches to evade hitting objects and property. This is certainly a time-consuming activity. On the other hand, employing a crane enables the professional operators to remove the tree within a mere couple of hours and diminishes the amount of foot traffic that will be on your lawn. 6. It is the least invasive method. Choosing a crane removal service to remove your unwanted trees is also the least invasive method for a tree removal strategy. Using a crane ensures minimal damage to your lawn, as they don’t cause any ruts in your garden and they don’t generate any severe disturbance to the surrounding landscape. Alternatively, traditional methods of tree removal can produce a lot of consequences for the objects near the tree — especially if you are removing a large tree. If you are looking for quality crane hire in Sydney (or wherever you live), you must ensure you are working with a company that offers crane services for tree trimming and tree pruning. If your home has tall, towering trees, it can swiftly become difficult to perform effective, healthy tree trimming services and tree pruning services on your own. By utilizing a crane for tree cutting services, you can maintain the health and beauty of your trees.